Since 1974, the Walpole Village School has been preparing children for successful early childhood education. We are a non-profit offering preschool and pre-k for children aged two to five, and before and after-school care for children aged two to twelve. We provide a safe and stimulating environment for children to learn and socialize, guiding them to make kind, respectful choices in their school community. Children are challenged to explore the classroom space through a variety of age appropriate themed activities. At Walpole Village School we offer a flexible schedule to meet the needs of many. 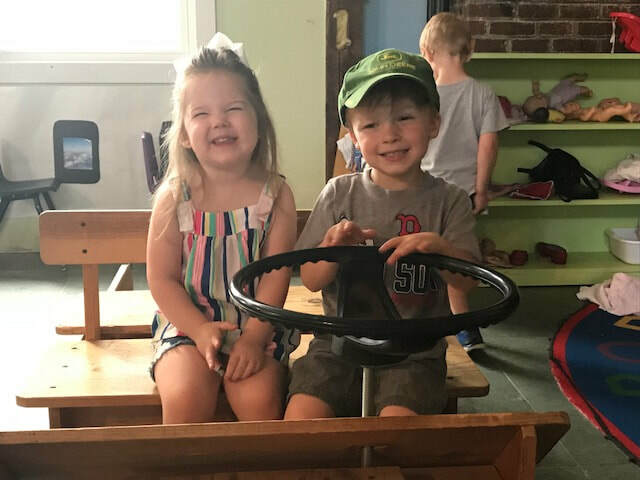 Our morning preschool offers a variety of play based activities to help children explore the world around us while learning social/emotional skills, early literacy and math skills. After our traditional preschool program ends at 11 AM, we offer lunch and nap time for children that stay for the full day. Our afternoon Pre-K program is for kids age four by September 30th, this provides a more structured portion of the day teaching children more specific early learning skills that will help prepare them for a full day of kindergarten. For kids ages two to twelve, we provide care before normal school hours starting at 7am and after normal school hours ending at 5pm. We work closely with the Walpole Primary School to ensure we can accommodate the needs of the working families in our community that need care beyond the traditional hours of public school. Our camp for three to six-year-olds is based out of WVS and mimics much of what our preschool day looks like. Summer camp weeks are theme based and families can pick and choose what days/weeks will work best for their child. Our camp for seven to ten-year-olds is based out of WVS with walking field trips built into the weeks including trips to the Walpole Town Pool. This too is theme based and we offer two day. three day or five day options to accommodate the needs of the families. Jody Metcalf, Director. Jody has been working at WVS for more than four years. She lives in Charlestown with her husband and two children. Melissa Jeffery, Lead Teacher. Melissa has been working at WVS for more than six years. Melissa lives in Keene with her husband and son. Allie Lansberry, Lead Teacher. Allie has been working at WVS for 10 years and has worked her way up from a high school senior to a Lead Teacher. Allie resides just over the border in Westminster, VT with her husband and daughter. Jody Elsesser, Assistant Teacher. Jody has been working at WVS for more than 10 years. She started as a volunteer when her daughters attended WVS and has remain a part of the school ever since. Jody lives with her husband and two children in Alstead.